XBox 360 Spindle Hub & Motor for BENQ VAD-6038 OR Lite-On DG-16D2S Drives. Please select the correct model of your DVD drive before you add to cart. The numbers on the Lite-On motor are not important. 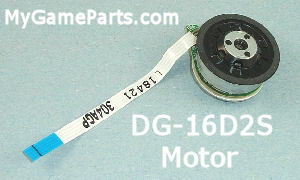 If you have a DG-16D2S or DG-16D2S-09C, please select that model's motor and it will be compatible with your drive even if the numbers on the motor may be different.